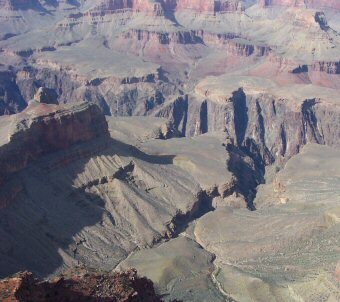 Who doesn't know about the Grand Canyon? It's one of the jewels of the National Park Service, a treasure of rich colors and millions of years of history. 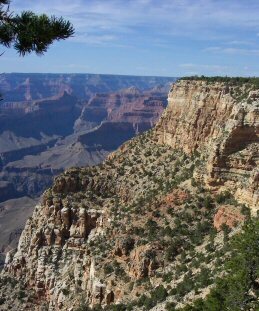 Canyons carved by the Colorado River as the Kaibab Plateau uplifted during an aeons-long process are on display from many vantage points. Snow in the winter gives a whole new perspective for the visitor. Mule rides down to the bottom and back up again are available; many trails exist for the fit hiker. Even some helicopter rides, and plane rides, offer a unbeatable view of Nature's creations. 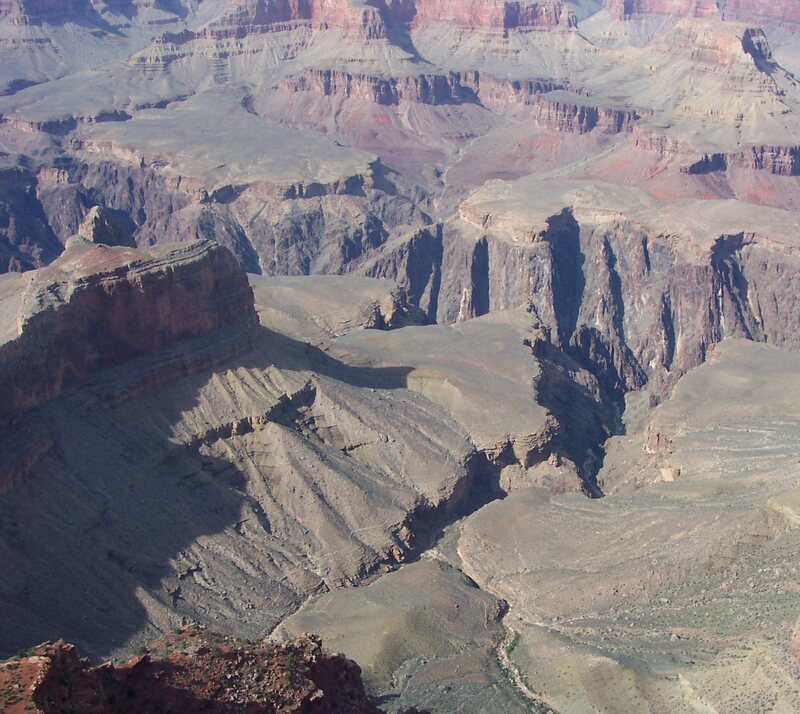 What you're going to see is an awe-inspiring look at 1.8 billion years of history, and the largest canyon in the world. Over that span the Colorado River has been carving down the canyons and spires you see, putting on view cliffs that drop a mile from Rim to River. Prepare to be astonished, awed, and amazed. Also prepare to be innundated with other visitors. 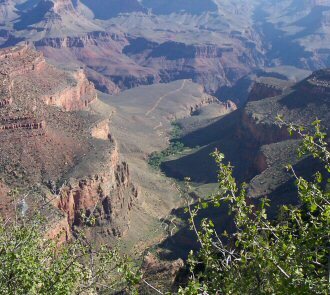 The Grand Canyon is one of the most popular National Parks, and the summertime crush is becoming legendary. The Park Service is struggling with this issue, so be prepared to do your part by leaving your car at a parking lot and taking one of the many buses that travel in a loop. They stop at all the major viewpoints, and you'll be helping the congestion. From April through September, much of the South Rim is only available on foot or by shuttle. The buses come by only about every 15 minutes (in April), not enough to avoid relieve concerns of nervous visitors. But relax and you will get a ride, and the views are simply fantastic. All right, time for one of my pet peeves. 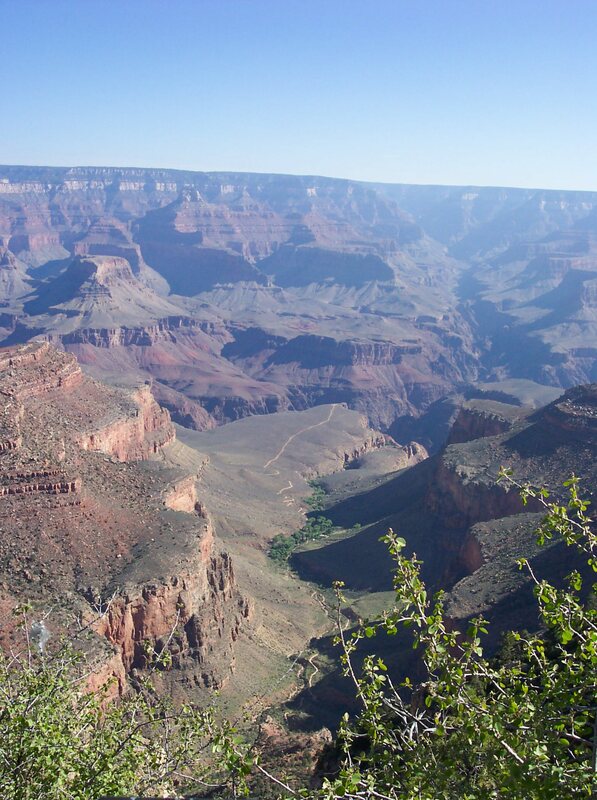 Guess what the average viewing time is, per visitor, of the Canyon. No, wait! First consider how far away it from everything. 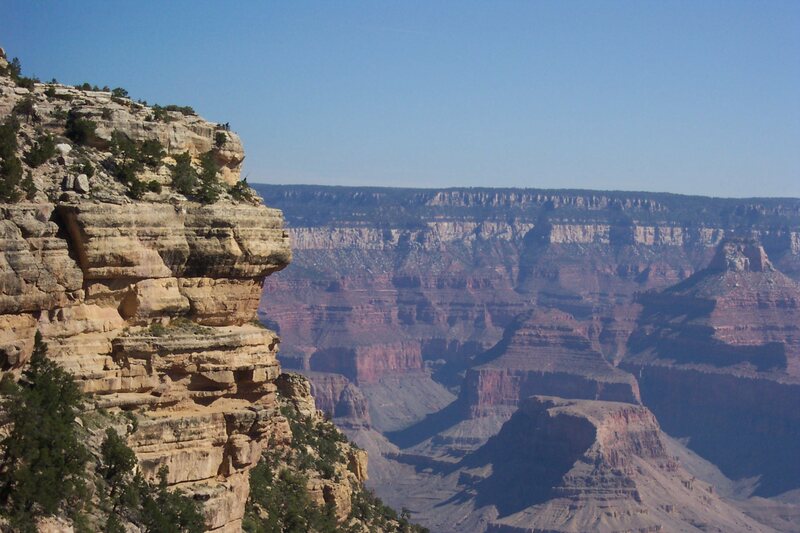 The nearest city to the South Rim is Flagstaff, itself still an hour's drive away. Therefore, most visitors really go out of their way to see the Canyon. So how long do they spend staring at the sights? Eighteen minutes. That's right, you scalawags, eighteen minutes of observing one of Nature's most impressive works. That stinks! And I'm as guilty as the rest. My second trip to the Canyon was a special trip for me and my five-year-old son. We drove all day to get there, spent, oh seventeen minutes looking around, when he asked when we'd see the Grand "Cannon". Seems he didn't hear me right when we piled into the car that morning. Okay, all I'm saying is, be prepared to spend some time enjoying it. Take the train from Williams, take a mule ride to the bottom (or hike down and up if you're adventurous), camp at the bottom and explore from below, but please do as I say and enjoy it. Spend some time appreciating the beauty we have. The Visitors Center is fantastic. Built as a spacious plaza, you can find huge murals of canyon life and extensive cut-away diagrams that explain how the canyon was laid down millions of years ago. The bookstore is great, and as always the Park Service staff are patient and eager to help. Many Ranger-led programs are offered; look into these to learn more. 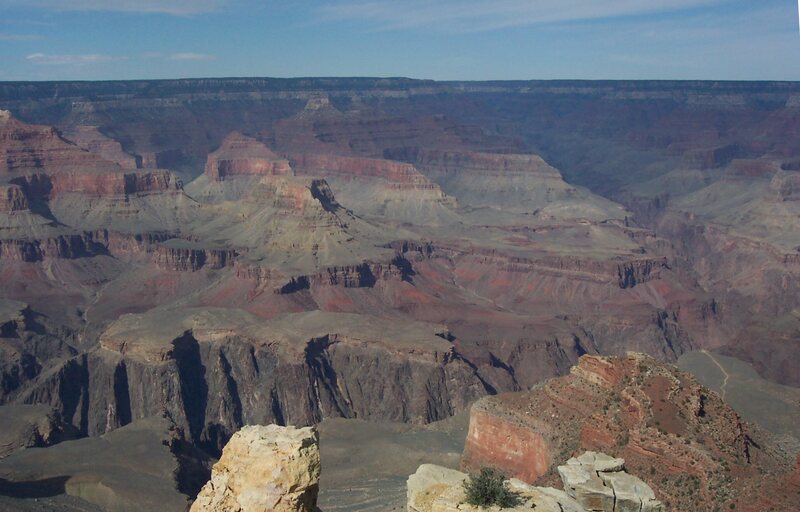 The North Rim takes four more hours of driving from Flagstaff, but it's less crowded. It's closer to St. George, Utah than it is to Flagstaff. From Flagstaff, there are two ways, depending on where you want to arrive. Take I-40 west for 32 miles to Williams, then go north on AZ 180. After 57 miles, you'll arrive at the west entrance. 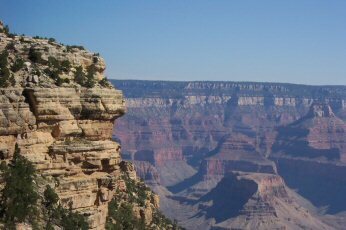 Or, from Flagstaff, go north on AZ 89 for 54 miles to Cameron. Turn west onto AZ 64 for 32 miles, and you'll arrive at the east entrance.